From poinsettias to a Christmas cactus and holly to mistle toe, or even a fun Hannukah bush, giving and using plants as holiday decor and gifts is a time honored tradition. Unfortunately not all holiday plants are safe for pets. 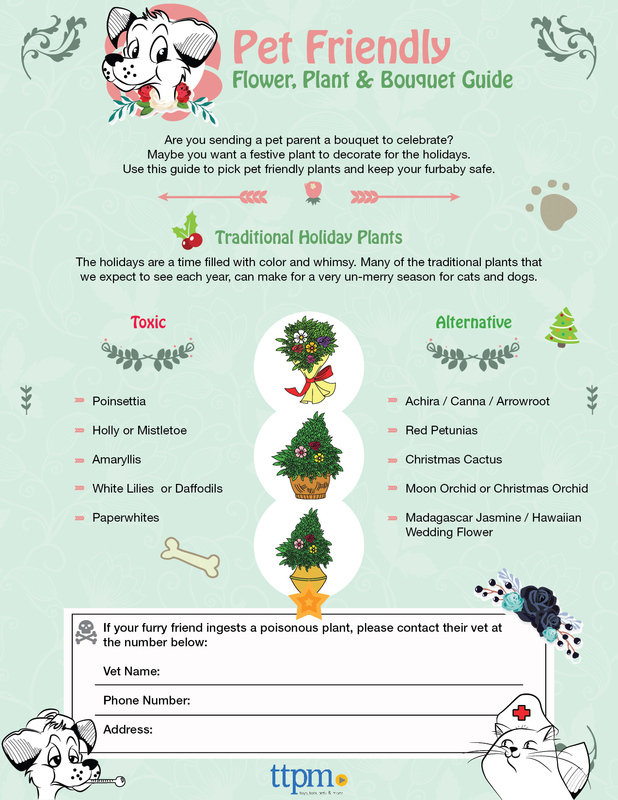 That’s why we’ve put together this helpful guide to help ensure all of your holiday plants and flowers are pet safe and pet friendly. You can print out a copy if you need a helpful reminder while shopping for gifts or decor, or simply share this post on social media if you know someone planning a party and you want to keep their furbabies safe. The holidays should be about celebrating and not taking an unexpected trip with your four legged friend to the vet. We scoured the web and found which holiday plants and flowers are safe or friendly for playful pups and curious cats. The chart above will help you find what you can more safely “deck your halls” with while not worrying about your furbaby getting poisoned. If you’d like more information on each, the * next to the plant or flower above links directly to the source of where we found the information. We also recommend that you carefully and thoroughly rinse all plants before bringing them into your home. You never know if they were treated with preservatives or pesticides that could be toxic to pets. If you have any specific questions about how the plants and flowers are treated, or want more information about what makes a flower or holiday plant safe for dogs and cats, your licensed veterinary professional is always your best resource. The holidays are a time for fun, laughing and enjoying the ones we love. That includes our furry family members. Use the guide above when selecting plants as decor and flowers or bouquet gifts for families with four legged friends so that everyone can enjoy the season without unexpected trips to the animal hospital or vet. Also, don’t forget to check out our dog toy and cat toy reviews to find the “purrfect” present for your family’s best friend.